In many vacuum control applications, a filter or long run of piping exists between the vacuum regulator and the vacuum process to be controlled. In these situations, it is difficult to achieve accurate vacuum control with a standard vacuum regulator because the regulator cannot compensate for these significant pressure losses. For these applications, a “Remote Sense” at the process is needed to help the vacuum control valve control the process directly to the desired pressure. 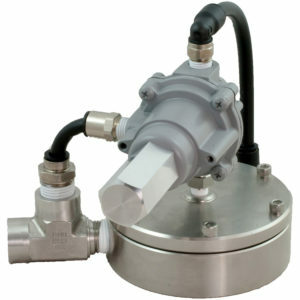 The Equilibar vacuum regulator (EVR) is a dome-loaded pilot operated vacuum regulator. It can be regulated with mechanical or electronic pilots in open-loop or closed-loop control schemes for precise vacuum control. Equilibar now offers the RSV mechanical vacuum pilot with Remote Sense capability, dramatically increasing the performance for these types of applications. The RSV is a highly sensitive mechanical vacuum pilot regulator designed specifically to provide closed-loop control of an Equilibar vacuum regulator (EVR). It actively adjusts the pilot reference vacuum level on the EVR to maintain an extremely steady vacuum setpoint despite large variations in flow. The RSV has a remote sense port for a tube that can be connected to a line near the process to be controlled. The schematic below shows a process configuration with a filter creating a pressure drop between the controlled process and the Equilibar vacuum regulator. A remote sense line is installed between the RSV pilot regulator and the controlled process. The RSV works by using this remote sense input to carefully adjust the vacuum force that is applied to the pilot reference port of the Equilibar vacuum regulator. During higher flow conditions, The RSV increases the reference vacuum level to open the vacuum regulator more fully. The opposite occurs during low flow conditions. This active pilot adjustment coupled with the instantaneous response of the Equilibar EVR keeps the pressure stable from the lowest flow rates to the maximum capacity of the EVR. The RSV can be integrated with any Equilibar vacuum regulator to provide remote sensing for improved vacuum control. The graph below compares the performance of an EVR-GSD4 (1/2” inlet port) controlled in a standard open loop configuration, with the performance controlled in an RSV remote sense configuration. For more information about how Equilibar products can help improve your vacuum process control, please contact an application engineer.